Occasionally I have to put off paying a bill, but I've never had trouble buying food for my family. On a recent Saturday afternoon, I met a lot of Anchorage neighbors who do. 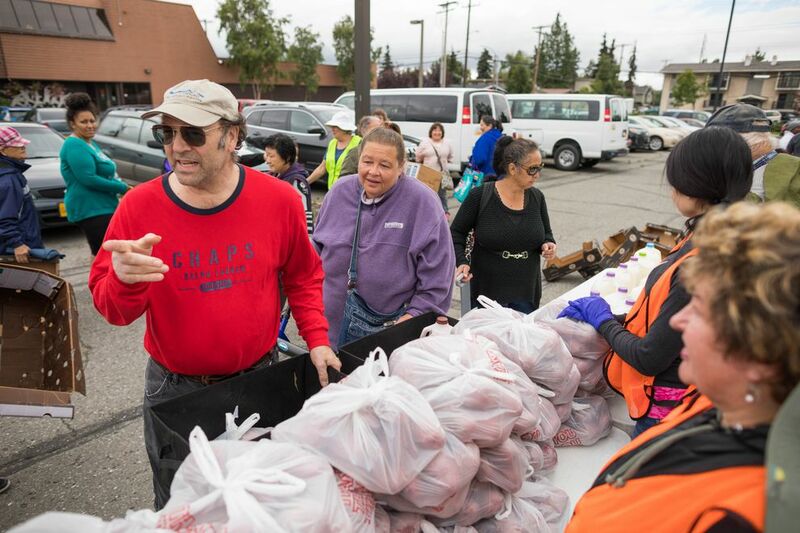 The Anchorage East Rotary Club invited me to its Mobile Food Pantry giveaway. I thought I'd be writing about the Rotarians. I knew many of the two dozen business people and retirees behind the tables, friends I've often met at functions and meetings. I guess they're just like me. I thought the people on the other side of the tables with shopping bags and luggage carts would be the destitute poor or victims of temporary emergencies. I discovered they were just like me, too. 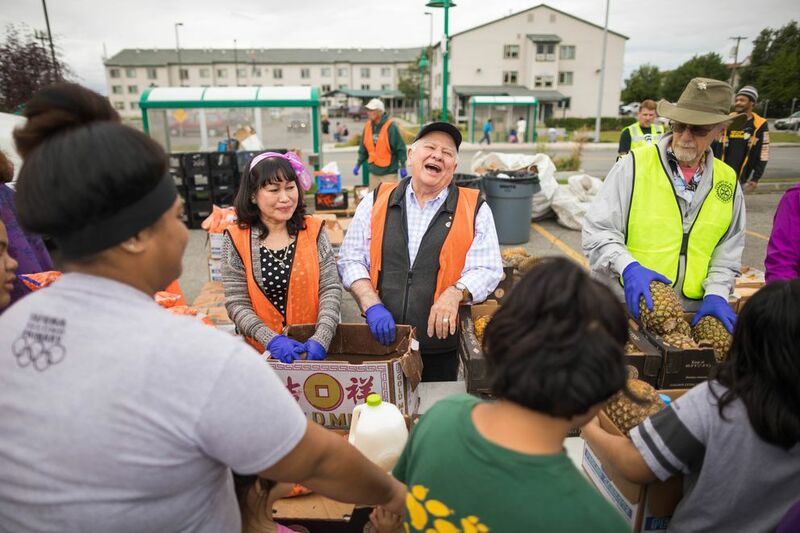 A shocking number of the Alaskans who work full-time jobs cannot afford food and routinely humble themselves at these giveaways of browning grocery store produce and baked goods on the verge of staleness, despite putting in many hours on the job. I met a young Alaska Native man who loads cargo on the ramp at the airport but has too many mouths to feed at home and can't stretch his paycheck over rent, expenses and food. A Korean woman had her elderly mother in tow, children at home, an apartment and a car payment, and a job that doesn't cover it all. A young white woman works as an artist, a craftsperson and a laborer. She is studying for a degree to get a medical job, so she won't need free food. Maria Bernal collects food for herself, her daughter and her elderly neighbors, and distributes it in the halls of her building on Government Hill. She owns her own janitorial business and works many hours, but to get jobs cleaning offices she has to underbid competitors, so there's not much profit. Tom Shanks works for the Anchorage School District taking care of the plant at Taku Elementary School. Like others in his union, he makes $19.60 an hour for 10 months a year. This year his wife had serious health problems and lost her income, and he took unpaid leave to help her. Shanks said he couldn't pay his debts while waiting for his first paycheck of the fall. His take-home pay is about $1,000. Although rent on the couple's Mountain View apartment is low — they have lived there 22 years — it is late. Tam Agosti-Gisler, president of the Anchorage School Board, was among the Rotarians handing out produce, including to Shanks. "It's not the first time a district employee has gone through there. They're obviously a little embarrassed to see me, but, hey, hungry is hungry," Agosti-Gisler said later. She said Shanks' pay should be a living wage, although she was sympathetic for the hard times he has faced. She pointed out that with benefits, workers like him are not cheap to employ. Including the 37 percent added for health and retirement, Shanks costs the district around $56,000 a year. A 2015 Alaska Department of Labor report showed that wages for school and government employees have dropped significantly since the 1980s, when adjusted for inflation. Except for the very highest earners — those making more than $200,000 a year — all categories of Alaska workers have seen average real wages decline since 1989. 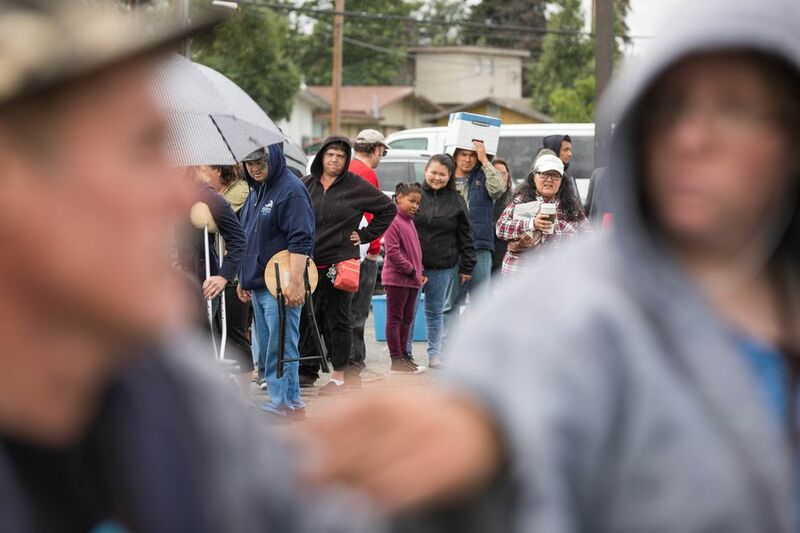 The proportion of Alaskans making the equivalent of $20,000 to $40,000 a year at full-time work rose from 28 percent to 34 percent in that period. Tom Shanks is in the middle of that group. The average apartment in Anchorage cost $1,135 a month in 2016, according to another Labor Department report. That's almost half the gross wages of those lower earners, before accounting for utilities, transportation or food. Some of this reflects a national trend of wage stagnation for the working poor and middle class, while wealthy Americans have earned more and more. But Alaska's economy is more complex. Over the past few decades, high-wage resource jobs went away while low-wage retail and service jobs increased. Our pay has fallen in 25 years, but the money we receive from investments, the Alaska Permanent Fund, and government programs went up, more than making up the difference. A good many people in line that Saturday morning were disabled, collecting enough money from Social Security to cover an apartment in the Fairview neighborhood but not much else. Disability payments make up an increasing part of the economy in depressed counties across the United States. The Food Bank of Alaska, which collects, warehouses and delivers the food the Rotarians were giving away, has found a growing number of clients use its service for basic support, not emergency rations. Even more people make too much for government food assistance but not enough to eat. Studies in 2004 and 2010 showed the number of Food Bank clients with a working household member rising from 29 to 38 percent. That was up to 43 percent in 2014 (although the number is not precisely comparable because the question was asked slightly differently). 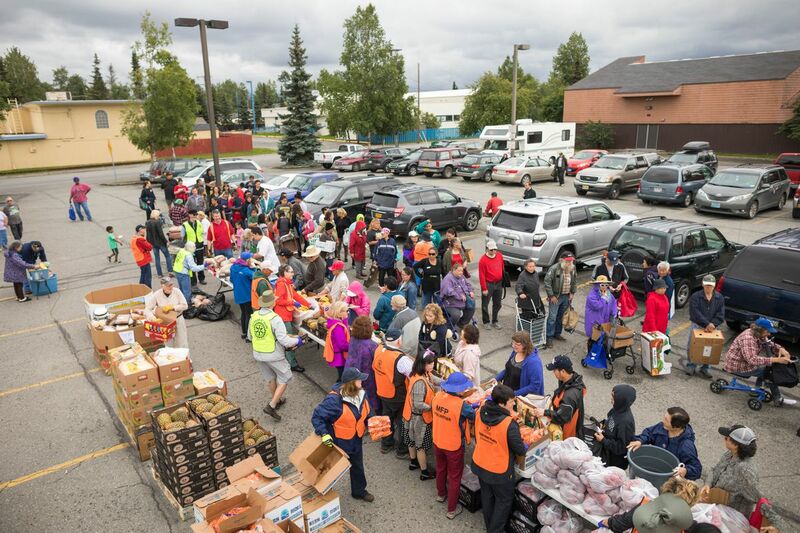 This one charity feeds 155,000 Alaskans a year, an astonishing 21 percent of our population. Good, solid people stand in the food line. The Rotarians knew some of them by name, many by sight. Raquel Edelen, vice president of operations at the Hotel Captain Cook, asked a young man to come and apply for a job. He was working full time at McDonald's. In seven years volunteering here, she has found new hires who made it high into her organization. As the last of the beets and iceberg lettuce passed over the card tables and the Fairview parking lot cleared, I felt a powerful emotional lift at having seen a hundred acts of kindness by the Rotarians and many hugs of gratitude from the people they helped. But I was also troubled. We've created an economic system where working doesn't pay to live. Dignity attaches to people who toil at jobs all week and then must ask for food on Saturday. The deadbeats are those businesses paying less than a living wage. They make their profits off this charity.